AJ Engineering is celebrating 20 years in business with a calendar of events including a virtual bike ride covering 21,000 miles the same distance travelled completing jobs in one year. 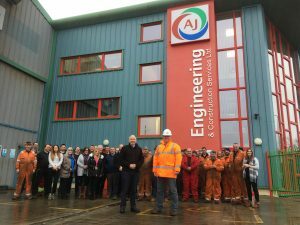 AJ Engineering is known for its expertise in building bridges and creating bespoke items for its customers. It will shortly begin a £300K project on the Kessock Bridge for The Spencer Group to fabricate and replace the inspection gantry which is used to carry out examinations on the bridge.